I love it when the tables are turned on people who interview others for a living. It’s so much fun to see inside their lives and hear what they have to say. That’s exactly what we get to see in the September 2014 issue of Better Homes & Gardens magazine. An interview with the gorgeous and talented TODAY Show anchor Natalie Morales! 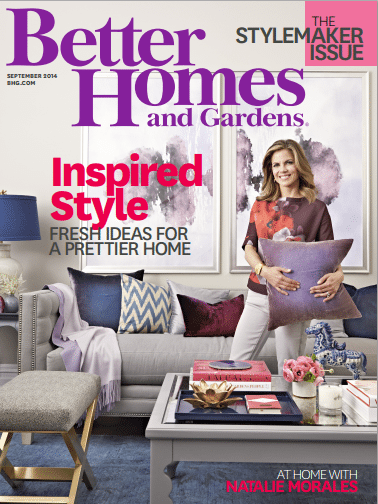 The Better Homes & Garden Fourth Annual September Stylemakers issue hits newsstands tomorrow, August 19th and we get to see inside Natalie’s New Jersey brownstone. BHG partnered with OneKingsLane.com to give Natalie’s living room a makeover. They turned her neutral space into a modern and colorful space the whole family can enjoy. If you like what you see in her newly decorated living room, you can shop the look from August 21st through September 18th on a special page dedicated to her room re-do at OneKingsLane.com. Here are a few snippets from Natalie’s interview where she talks about her hero, her design personality and creating a space with two boys in the house. See more from the interview at BHG.com and in the BHG September Style Makers issue on newsstands tomorrow!